Now that the weather is getting better, it's time to really start thinking about your outdoor fitness regime. 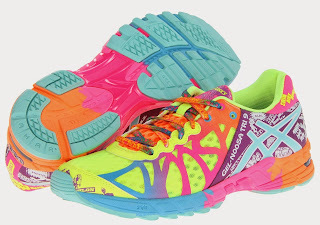 Running is not just good for the body, but for the mind as well, which is why we're excited to highlight one of our favorite athletic shoes, the ASICS GEL-Noosa Tri™ 9. Created to take whatever you can dish out, this racing flat is especially constructed to fulfill the needs of triathletes. It boasts redesigned, seamless mesh and synthetic upper materials, a glow-in-the-dark print that livens up each stride, a plush tongue and collar for added comfort, an optional pair of elastic laces, perforated sockliner promotes enhanced breathability and moisture drainage, an ASICS design philosophy (I.G.S® Impact Guidance System) that employs linked componentry to enhance the foot's natural gait from heel strike through toe-off, a dynamic DuoMax® System increases stability and support with reduced weight and enhanced platform comfort. Other notable details include Propulsion Trusstic® to mimic connective tissues in the foot by creating tension as the foot enters the propulsion phase, Guidance Line® technology that employs a vertical flex groove that decouples the tooling along the line of progression for maximum stride efficiency and a Wet Grip® outsole is constructed of a mixture of organic and non-organic compounds, designed to enhance traction on wet surfaces.Available in two colors, the above perfect-for-spring, flash yellow/turquoise/berry and black/neon coral/green, these are available for $129.95.